Deep in the swamps of Louisiana, the local populace is slowly (very slowly) become aware that something is stalking through the wetlands. This beast is tearing apart anyone it comes across. A couple of dopey brothers are on the case. Elsewhere, some scientists show up and explain that they may or may not be responsible for the monster, thanks to their experiments in revolutionizing the fur industry by creating a giant nutria-man. 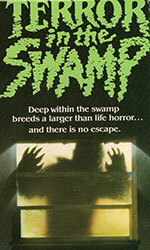 Yes, the swamp monster has been birthed from adorable giant river rats, and is now terrorizing the human race. Will the police stop the violent mob that has risen up to kill the nutria-man? Will the stupid scientists high-tail it out of town before they get caught? Will the nutria-man stumble around the swamp for twenty minutes straight? Terror in the Swamp (or Nutriaman, The Copasaw Creature if the end credits are to be believed) is more or less a Bigfoot movie. Therefore the bar for quality is already pretty low. The monster is relegated to point-of-view shows and shadowy glimpses, which is probably for the best. The real stars of this film are the parade of swampfolk, from the greasy trappers, a grey haired cackling witch, to the mob of shirtless yahoos who sit in their boats and yell things. In reality, the monster just slows the story down and takes away from all these quirky characters. If you’re into Bigfoot movies, or swampsploitation, this isn’t a bad film at all. Anyone else might find it slow and dull.